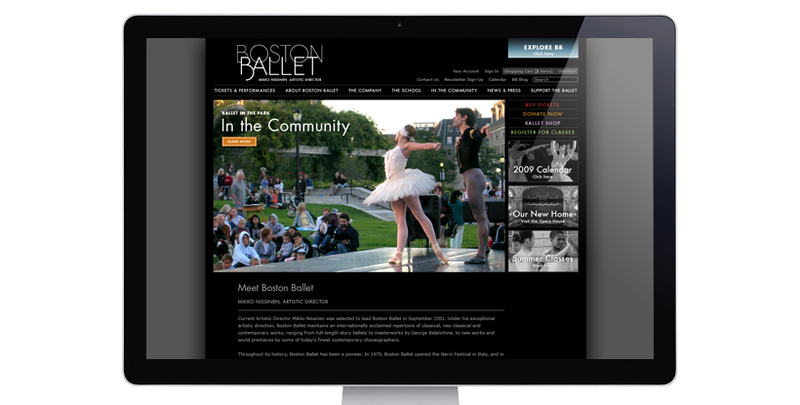 Korn Design was engaged to translate the sophistication and leading edge nature of Boston Ballet, into a compelling new brand identity and a refreshed overall look + feel for the company and organization as a whole. We felt the identity to best represent Boston Ballet must be strong, modern and sophisticated yet maintain an element of warmth and refinement, a true mix that could hold up against this world-class institution. The new logotype was created to express the lyrical and ever-in-motion dna of the company at it’s core while maintaining careful balance, exquisite precision, an open viewpoint and a flair of personality. Korn Design, under the hand of designer Ben Whitla, crafted a hand-drawn, custom typeface for Boston Ballet which sits boldly at the center of its new identity. It has been a pleasure collaborating with Boston Ballet’s in-house designer Kristin Carr on this new brand extension and the entire BB team! It is a pivotal and exciting moment in time for Boston Ballet as it moves to its new home in Boston’s Opera House.